Night lights are small lights that are usually used just at night to provide a little bit of light in otherwise dark spaces. The light is typically low and doesn’t illuminate the whole room. They are very popular in children’s rooms where solid darkness can be frightening to a child. Even teens and adults may prefer using night lights rather than have a pitch dark room. There is quite a selection of different baby night lights on the market. Having so many choices can make choosing one a real challenge, especially for a new parent. In these three top rated choices, we will list the features, benefits and more so you will be able to make an informed decision on the best baby night light for your baby. Night lights make it much easier to get around a room without having to turn on a full, bright light that can be very disruptive to the occupant’s sleep. Night lights come in a variety of shapes, designs and sizes. Some are specifically for use in children’s areas and others can be used in adult rooms, bathrooms and dimly lit halls. 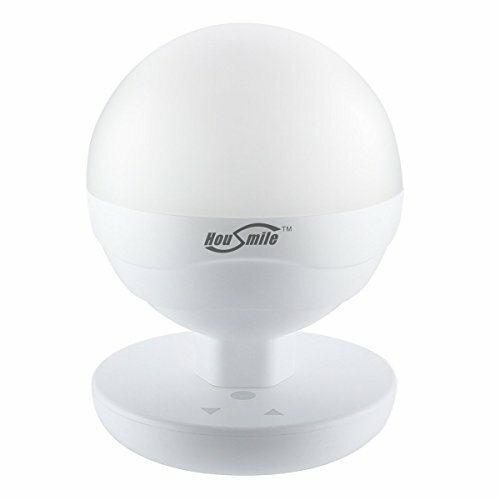 There are many uses that the Housmile Multifunctional Intelligent Night Light can be used for. It has many features that make it the perfect light for many different situations. The unique design has a stepless fingerprint touch and you can adjust the brightness level according to what you need to do. The LED light source is energy efficient and environmentally friendly as well. It doesn’t hurt the eyes and has a large light emitting area that puts off more light than a 15 watt regular light bulb. The high quality service life exceeds 5000 hours and at the strongest light it can last from 5 to 50 hours. It is constructed from high strength PC and ABS material that is resistant to breakage and impacts. Charging time is only 3-4 hours and the light can be kept on while it is charged. The retractable hand strap at the bottom of the light which makes it very easy to carry. Another interesting and helpful feature of this light is that it will automatically remember the last brightness level that it was used at. The special optical design lampshade adds style to the night light as well. It is the perfect light for many different scenarios including low light, romantic dinners, camping, power outages, reading lights, taking care of the baby at night, and many other things as well. It comes with a 100% satisfaction guarantee that includes a 30 day money back guarantee and a 1 year warranty. 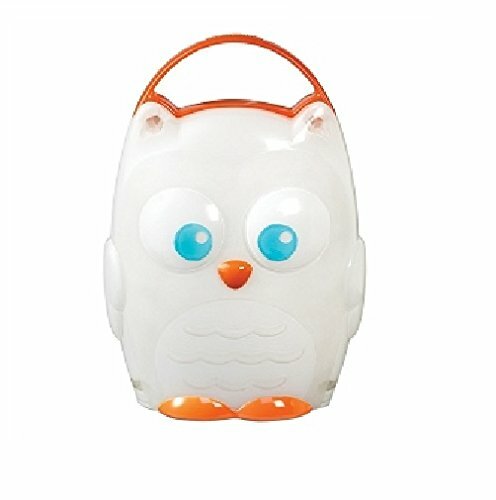 This adorable little portable night light is shaped like a cute little owl making it the perfect addition to any baby or child’s room. 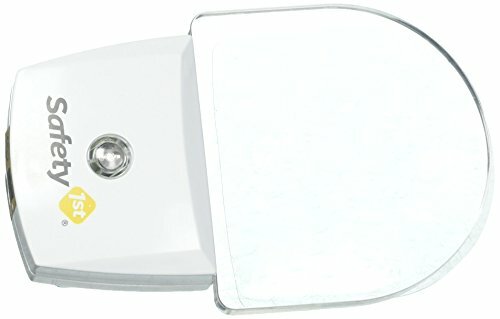 This unique light has a carry handle that allows little ones to bring it with them to the bathroom or parent’s room if they need to. It is easy to use, even for very young children thanks to the one-button operation. This little owl nightlight is battery operated so there are no cords to worry about or charging that needs to be done. The convenient 20 minute timer saves the unit’s batteries by automatically shuts off. No worries about little ones getting burned because the LED light does not get hot to the touch. Constructed from plastic, this light is durable and will be perfect for toddlers and young children. It includes 3 AAA batteries to make it run that are included with the light. The soft glow of the Munchkin Light is perfect for nighttime check-ins on the baby, changing their diapers and helping them get back to sleep if they wake up afraid. Add a long lasting glow to any room you want with the Safety 1st LED nightlight. The LED that powers this light lasts up to 25 times longer than regular bulbs. There is no worry of anyone getting burned with this nightlight because it is cool to the touch when it’s being used which makes it perfect for a child’s room or child’s bathroom. It passes all UL standard requirements and costs as much as 87% lower to use. There are two handy nightlights in this pack, each measuring 2.4” x 2” x 4”. Just plug them into any wall outlet and you have perfect light ready to come on by itself as soon as it is dark in the room or hallway you have them plugged into. The occupants of the room will not be disturbed by the light because it is not excessively bright. It provides enough light to move safely around the baby’s room or wherever the light is plugged in. Safety 1st is a well known and trusted name in baby products and these LED nightlights are a great product that shows just how much this company knows about creating great and useful baby products. With all of the choices available for night lights, it can be very difficult to choose the best night light for your baby. These top rated night lights are all terrific for providing light for the rooms you need them in. Whether it’s a night light for a baby’s room or one for the bathroom for nighttime visits, any one of these three top rated night lights will get the job done. If you’re having trouble deciding which nightlight is the best one for your family’s needs, read the following buyer’s guide and learn what makes a great night light. The information in this buyer’s guide will teach you about the best features for nightlights, the benefits of using them, and how to choose the right one for your family. What is a Baby Night Light? A night light, just like the name indicates, is a special light that is designed to be kept in a baby or child’s room. It illuminates the room just enough to be able to move around, feed the baby, change a diaper, or any number of other things that you may need to do at night but you don’t want to disturb the child by turning on a bright light. There are many benefits of using night lights. We have outlined these benefits that you can take advantage of by utilizing night lights for many rooms in your house. Comforting children who are afraid – Night lights are the perfect solution for a child of any age that is afraid of being in the dark. This is a common problem, and night lights are a great way to chase those fears away. Provides light for checking on the baby – Parents check on their baby’s routinely at night once they have gone to bed. Rather than bump around in the dark or worse, wake the baby by having to turn on a bright light, a night light enables parents to see where they are walking as well as checking on the baby to make sure they are fine. Helps children find a teddy bear or blanket that has fallen off their bed – During sleep, blankets and teddy bears can get pushed off the bed or get moved down to the bottom of the bed. Having a night light in the room helps the child relocate their blanket or stuffed animal so they can get it back where it belongs. Changing Diapers in the middle of the night – when a baby is very young, they often have to be changed during the night. Having a night light helps the parents change the diaper while preventing the baby from being woken up completely by a bright light. Helps parents go back to sleep – Night lights are not just for children. Having to make midnight or later, trips to the baby’s room can make it difficult for the parent to get back to sleep well. A night light keeps the lighting dim for the parents too and makes it much easier to fall back asleep once they go back to bed. Turning on a light that is bright can wake your brain up and makes it much harder to get back to sleep. They are cheaper to run than regular lights – Sometimes parents will leave a hallway or bathroom light on outside the child’s door. This method does provide light but uses a lot more power than a night light would. Night lights typically use very little power at all and provide the same result, being able to see. There are a large variety of night light selections available on the market for parents to choose from. Having options is always good, but there is such a thing as too many choices. Having too many choices can make deciding on the best one for your baby rather difficult. Below, we’ve listed the different types of night lights so you will know the differences between the different styles. That will make your decision much easier. Plug-in – These compact night lights plug directly into the wall outlet. Some have motion sensors that will trigger the light when motion is detected. Others have darkness sensors that will turn the nightlight on as soon as it is dark. Plug in night lights are great for go check on their children in the middle of the night on a regular basis. Projection – Projection nightlights are very unique and offer the child a unique way to provide light in the room. This type of nightlight projects light onto the child’s wall or ceiling usually in a type of design. For the image to show up clearly, the projection needs to be at the right distance. Plush – This type of nightlight is a favorite with little ones that are afraid of the dark. They are shaped just like regular stuffed animals except they light up when the child squeezes or presses on them. They are operated on batteries and have an auto off that helps to save the batteries. Portable – Portable night lights run on batteries and don’t rely on wall outlets or electricity to run. They are excellent choices for power outages. Some of the newer models of portable night lights come with rechargeable batteries that can be recharged with a USB cable that is similar to the way a cell phone charging cable. Portable night lights are great for traveling as well. When you start looking at the different models of night light to make a decision, take the following things into consideration. Power Outlet Location – If you are interested in plug in night light varieties, take a look at where the outlets are located in the baby’s room or wherever you will be using the night light. You want to be sure that the light is not too close or too far away. Light Color – Parents may be surprised to know that red and orange hues actually imitate the sunset and help the body think that nighttime, and subsequently, sleep, is approaching. Bulb types – LED is a very popular night light bulb choice because they use much less energy, they are not hot to the touch, they last much longer and have a softer light. Brightness level – You want the night light to be bright enough to see what you need to see, but not so bright that it wakes the child or prevents you from going back to sleep. There is a simple way to test the brightness of the night light. Close your eyes and see if you can still see the light. If you can see the light even with your eyes closed, it is probably too bright for inside the baby’s room. There are several safety tips that you should pay attention to when using night lights. We have listed them below for you. Keep your baby away from any night light that has small parts. The package can tell you if there are any small parts to worry about with the night light you choose. Pay attention to any recalls on night lights. If a night light you have ends up on a recall list, immediately stop using it and contact the manufacturer. Getting shocked can be very serious if the shock is severe enough. Keep babies and young children away from night lights. They can unplug them and even spill liquid on them accidentally, causing a short. Never leave your baby out of their crib unattended and make sure the baby can’t reach the night light from their beds. With all of the great choices on the market, you may have been worried about choosing the right night light for your needs. The information in this review and buyer’s guide has the information that parents need to make the best choice they can for their families. Having a good quality night light in the right place can make the night much less scary for your child and can make it much easier for you AND your child to fall back asleep once their needs are met.